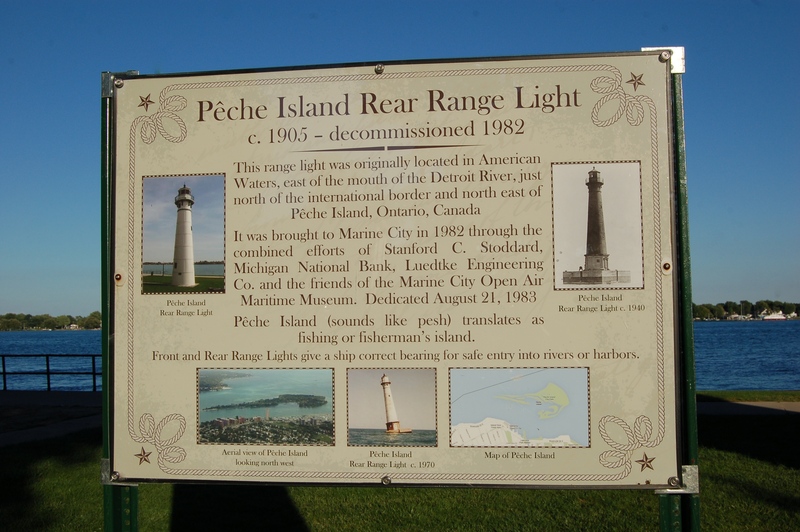 The Peche Island Rear Range Light sits in a riverside park in Marine City, where it is easy to view. 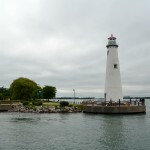 It has been there since 1983, when it was moved from its former location in the Detroit River near Canada’s Peche Island (close to the Windmill Point Light and Belle Isle). 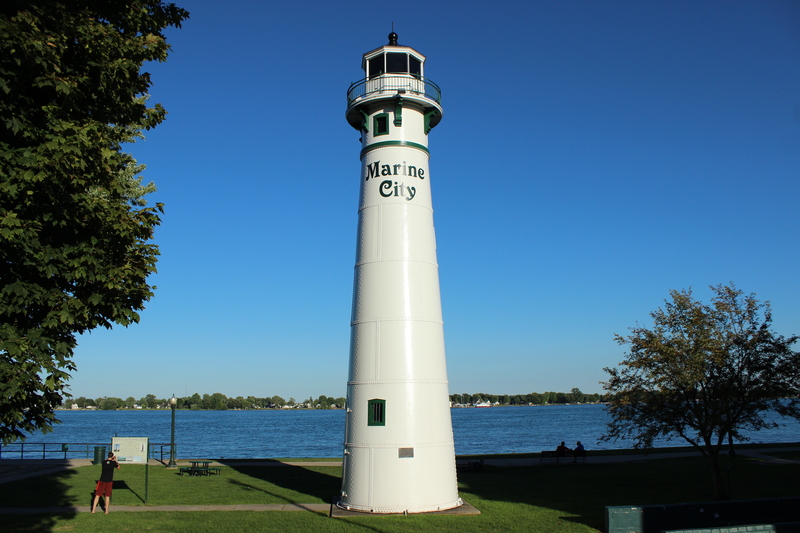 Thanks to a fresh coat of paint and some upgrades in 2014 this lighthouse stands proudly in Lighthouse Park south of the waterworks building. 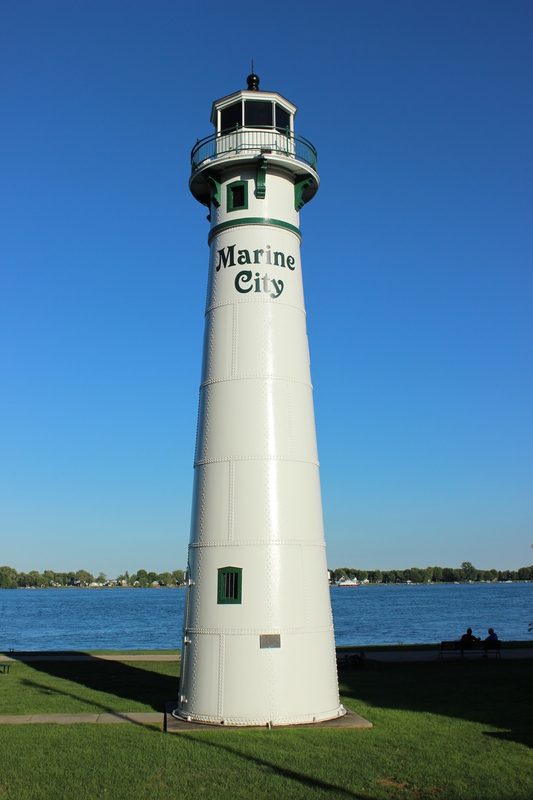 Its white steel plate conical tower is capped with a lantern room painted green, standing 66 feet tall. 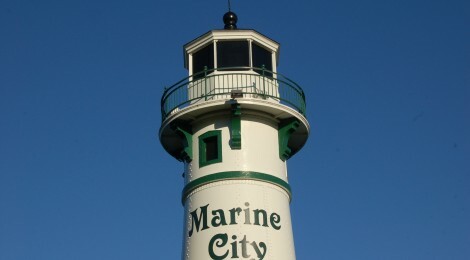 “Marine City” is painted on the tower in green just below the lantern room. 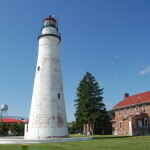 This light first went into service in the early 1900s and it guided ships for nearly 80 years. An informational sign in the park near the lighthouse reads: “This range light was originally located in American waters, east of the mouth of the Detroit River, just north of the international border and northeast of Peche Island, Ontario, Canada. 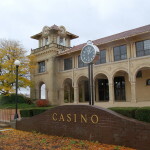 It was brought to Marine City in 1982 through the combined efforts of Stanford C. Stoddard, Michigan National Bank, Luedtke Engineering, Co. and the friends of the Marine City Open Air Maritime Museum. 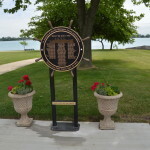 Dedicated August 21, 1983. 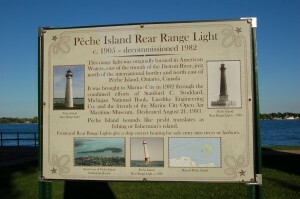 Peche Island (sounds like pesh) translates as fishing or fisherman’s island.” Several historic photographs of the lighthouse are also included on this sign. 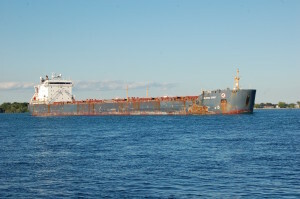 This is a great place to watch for freighters as they make their way up and down the St. Clair River. 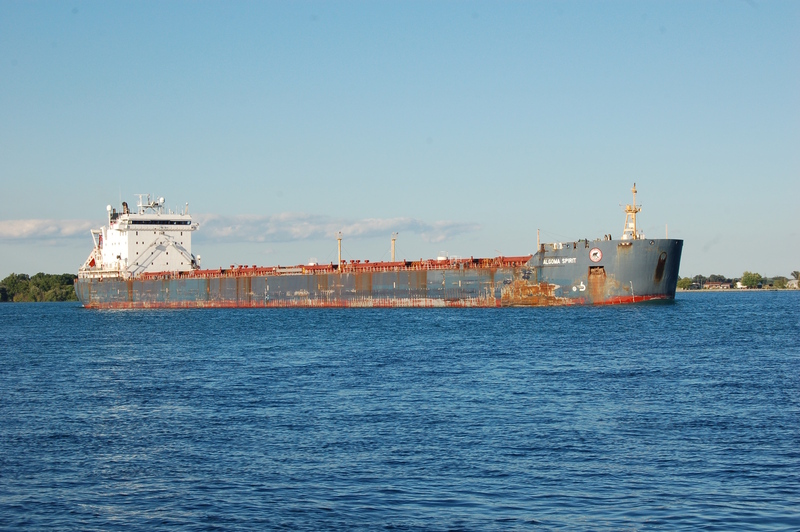 During our short visit here in 2016, two different boats passed by – pictured above is the Algoma Spirit, a 728-foot-long bulk carrier owned by Canada’s Algoma Central Corporation.